Earth and Environmental Engineering at the Henry Krumb School of Mines fosters excellence in education and research for the development and application of science and technology to maximize the quality of life for all, through the sustainable use and responsible management of Earth’s resources. The Earth and Environmental Engineering program fosters education and research in the development and application of technology for the sustainable development, use, and integrated management of Earth’s resources. Resources are identified as minerals, energy, water, air, and land, as well as the physical, chemical, and biological components of the environment. There is close collaboration with other engineering disciplines, the Lamont-Doherty Earth Observatory, the International Research Institute for Climate Prediction, the Center for Environmental Research and Conservation, and other Columbia Earth Institute units. The School of Mines of Columbia University was the first mining and metallurgy school in the U.S. (1864). It became the foundation for Columbia’s School of Engineering and Applied Science and later the home of the Department of Mining, Metallurgical and Mineral Engineering. However, the title "School of Mines" was retained by Columbia University honoris causa. You can see the bronze statue of The Metallurgist (Le Marteleur) in front of Columbia's Mudd Hall that was named after an alumnus of the School of Mines. One century after its formation, the School of Mines was renamed Henry Krumb School of Mines (HKSM) in honor of the generous alumnus of the School of Mines and his wife, Lavon Duddleson Krumb. HKSM has been a leader in mining and metallurgy research and education, including the first mining handbook by Professor Peel, the first mineral processing handbook by Professor Taggart, and other pioneering work in mineral benefaction, chemical thermodynamics, kinetics, transport phenomena in mineral extraction and processing, ecological and environmentally responsible mining, and pursuit of state-of-the-art research advancing responsible use of our earth resources. The Henry Krumb School of Mines located in The Fu Foundation School of Engineering and Applied Science offers students interested in mining and metallurgy the opportunity to focus their studies in these fields within the department of Earth and Environmental Engineering. In 1986, HKSM was designated by Governor Cuomo as the mining and Mineral Resources Research Institute of the State of New York. The Department of Earth and Environmental Engineering (EEE): With the creation of the Earth Institute at Columbia University, a major initiative in the study of Earth, its environment and society, the traditional programs of HKSM in mining, mineral processing, and extractive metallurgy were expanded in the late nineties to encompass environmental concerns related to the use of materials, energy and water resources, and to reflect one of nine departments of SEAS with a focus on the development and application of technology for the sustainable development, use and integrated management of Earth's resources. Columbia’s interdepartmental program in Materials Science and Engineering (MSE) is the successor of the HKSM traditional physical metallurgy program and focuses on the design of advanced materials and the effects of composition and processing on material properties. This program, administered by the Department of Applied Physics and Applied Mathematics, is described in another section of this bulletin. The Earth Engineering Center is the engineering unit of The Earth institute and is dedicated to directing engineering research toward the reconfiguring of industrial activities with full understanding of their environmental impacts. Several faculty of the HKSM are associated with the Earth Engineering Center. As a result of the vast developments in the technologies and fields of environmental management, in 1996 and 1998 respectively, the engineering school created the M.S. program in Earth Resources Engineering and the B.S. program in Earth and Environmental Engineering to meet the needs of a changed society. Students interested in the traditional disciplines of mining, mineral engineering and metallurgy continue to study these fields through the Earth and Environmental Engineering department course offerings as well as the course offerings through the Material Science and Engineering program. Starting in 1996, the educational programs of Columbia University in mining and mineral engineering were transformed into the present program in Earth and Environmental Engineering (EEE). This program is concerned with the environmentally sound extraction and processing of primary materials (minerals, fuels, water), the management and development of land and water resources, and the recycling or disposal of used materials. EEE offers the Bachelor of Science (B.S.) in Earth and Environmental Engineering, the Master of Science (M.S.) in Earth and Environmental Engineering, and the doctorate degrees (Ph.D., Eng.Sc.D.) in EEE. The EEE program welcomes Combined Plan students. An EEE minor is offered to all Columbia engineering students who want to enrich their academic record by concentrating some of their technical electives on Earth/Environment subjects. There is close collaboration between EEE and the Departments of Civil Engineering and Earth and Environmental Sciences, including several joint appointments. drinking water systems. Active field research projects are in India, China, Brazil, and Peru. The Global Flood Initiative recognizes that of all natural hazards, floods are responsible for the largest average annual loss of property and life. They are also a significant contributor to pollutant loading and environmental impact in water bodies. In a globalized society the disruption of food, energy, and manufactured goods supply chains by floods has also emerged as an issue. The initiative is developing state-of-the-art climate analyses for global flood risk projection, its mapping onto supply chains, and risk management using novel structural and financial tools. America’s Water is the third major initiative. It is driven by the goal of developing sustainable water management and infrastructure design paradigms for the 21st century, recognizing the linkages between urban functioning, food, water, energy, and climate. It seeks to pull together a comprehensive understanding of the issues facing water infrastructure in the USA. These include the financing of and investment in the replacement of aging infrastructure; pricing and allocating water, given changing values and climate; the management of the total urban water cycle through new technologies and network topologies; groundwater depletion and national food and economic futures; and novel opportunities for flood risk management and non-point-source pollution mitigation. in wastewater treatment and energy production. unit commitment and economic dispatch of conventional generators to compensate for solar and wind variability in large-scale penetrations. Resource assessment and recycling of critical energy materials variability: The CLCA, together with the Brookhaven National Laboratory are developing technologies for optimizing recycling of various elements from end-of-life photovoltaic systems and infrastructures for their collection. Life-cycle environmental and environmental health and safety (EH&S) risk assessment: Risk- and LCA-based comparisons of solar electric and conventional energy tecnologies in collaboration with Brookhaven National Laboratory and several European, South American, and Asian institutions. For more information: clca.columbia.edu; e-mail: vmf5@columbia.edu. Earth Engineering Center (EEC). 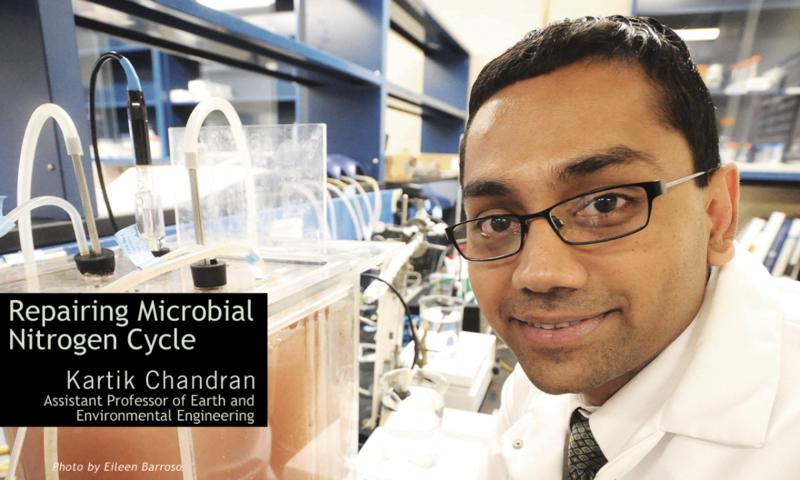 EEC was formed in 1995 with the original mission to direct engineering research at Columbia on processes and products that balance the increasing use of materials by humanity with the need for clean air, water, and soil. EEC introduced the teaching of industrial ecology, was the first engineering unit of Columbia’s Earth Institute, and co-organized the 1997 Global Warming International Conference (GW8) at Columbia University. As of 1998, EEC has concentrated on advancing the goals of sustainable waste management in the U.S. and globally. Economic development has resulted in the generation of billions of tons of used materials that can be a considerable resource, but when not managed properly, constitute a major environmental problem both in developed and developing nations. In 2003, in collaboration with the Energy Recovery Council of the U.S., EEC founded the Waste to Energy Research and Technology Council (WTERT). As of 2013, the Global WTERT Council has sister organizations in 14 countries including Canada, China, Germany, Greece, India, Italy, Mexico, and the U.K. Over the years, WTERT research at Columbia has engaged many M.S. and Ph.D. students on all aspects of waste management (see www.wtert.org, Publications, Theses). EEC conducts a biannual survey of waste management in the 50 states of the Union. Industry/University Cooperative Research Center for Particulate and Surfactant Systems (CPaSS). CPaSS was established in 1998 by the Henry Krumb School of Mines, Department of Chemical Engineering, and Department of Chemistry at Columbia University. The Center encompasses detailed structure-property assessment of several classes of surface-active molecules, including oligomeric, polymeric, and bio-molecules. The aim of CPaSS is to develop and characterize novel surfactants for industrial applications such as coatings, dispersions, deposition, gas hydrate control, personal care products, soil decontamination, waste treatment, corrosion prevention, flotation, and controlled chemical reactions. The proposed research thus focuses on the design and development of specialty surfactants, characterization of their solution and interfacial behavior, and identification of suitable industrial application for these materials. The goals of CPaSS are to perform industrially relevant research to address the technological needs in commercial surfactant and polymer systems, develop new and more efficient surface-active reagents for specific applications in the industry and methodologies for optimizing their performance, promote the use of environmentally benign surfactants in a wide array of technological processes, and build a resource center to perform and provide state-of-the-art facilities for characterization of surface-active reagents. International Research Institute for Climate Prediction (IRI). The IRI is the world’s leading institute for the development and application of seasonal to interannual climate forecasts. The mission of the IRI is to enhance society’s capability to understand, anticipate, and manage the impacts of seasonal climate fluctuations, in order to improve human welfare and the environment, especially in developing countries. This mission is to be conducted through strategic and applied research, education and capacity building, and provision of forecast and information products, with an emphasis on practical and verifiable utility and partnerships. Langmuir Center for Colloids and Interfaces (LCCI). This Center brings together experts from mineral engineering, applied chemistry, chemical engineering, biological sciences, and chemistry to probe complex interactions of colloids and interfaces with surfactants and macromolecules. LCCI activities involve significant interaction with industrial sponsors and adopt an interdisciplinary approach toward state-of-the-art research on interfacial phenomena. Major areas of research at LCCI are thin films, surfactant and polymer adsorption, environmental problems, enhanced oil recovery, computer tomography, corrosion and catalysis mechanisms, membrane technology, novel separations of minerals, biocolloids, microbial surfaces, and interfacial spectroscopy. Lenfest Center for Sustainable Energy. The mission of the Lenfest Center for Sustainable Energy is to develop technologies and institutions to ensure a sufficient supply of environmentally sustainable energy for all humanity. To meet this goal, the Center supports research programs in energy science, engineering, and policy across Columbia University to develop technical and policy solutions that will satisfy the world’s future energy needs without threatening to destabilize Earth’s natural systems. The mission of the Lenfest Center is shaped by two global challenges. First, the Center seeks to reduce the emission of carbon dioxide into the atmosphere and to forestall a disruption of global climate systems that would impose negative consequences for human welfare. Second, the Center seeks to create energy options that will meet the legitimate energy demands of a larger and increasingly wealthy world population. In order to meet these two challenges, the Center seeks to develop new sources, technologies, and infrastructures. The Lenfest Center focuses primarily on the technological and institutional development of the three energy resources sufficient to support the world’s projected population in 2100 without increased carbon emissions: solar, nuclear, and fossil fuels combined with carbon capture and storage. Although each of these options can, in theory, be developed on a scale to satisfy global demand, they each face a combination of technological and institutional obstacles that demand research and development before they can be deployed. The department arranges for undergraduate summer internships after the sophomore and junior years. Undergraduates can also participate in graduate research projects under the work-study program. Graduate research and teaching assistantships, as well as fellowships funded by the Department, are available to qualified graduate students. GRE scores are required of all applicants for graduate studies.